We live in an environment characterized by very low yields. Most investors focus on yield in the context of the cash return on their investments. Another way to look at yield is to look at how much one is willing to pay for a dollar of income. 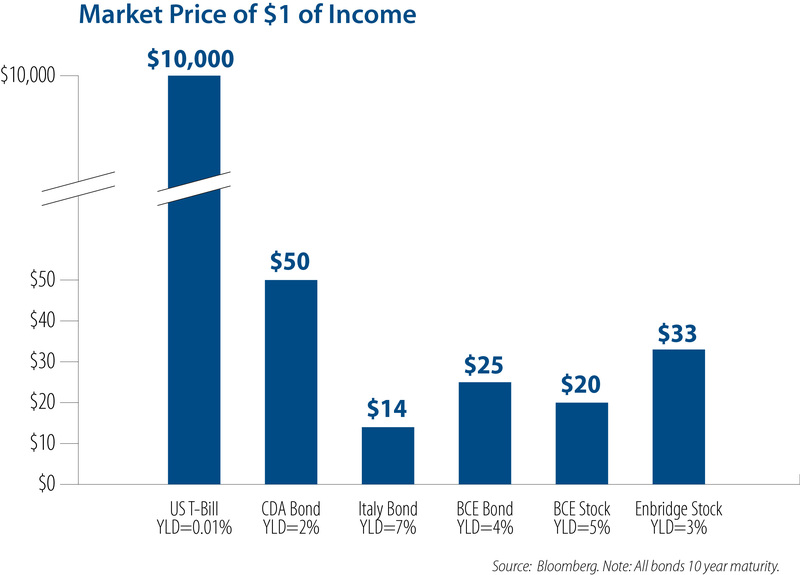 In today’s low-yield world, the prices paid by investors for different income streams are as wide as they have ever been, putting the question of risk and reward to an interesting test. For example, an investment of $10,000 in US T-bills, results in $1 of income. This is because US T-bills are perceived to be the safest investment on the planet. 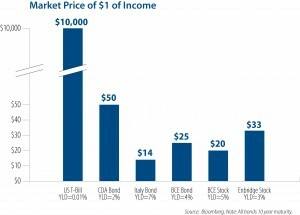 By comparison, a $50 investment in 10-year government bonds, which yield 2% today, will realize $1 of income. Investors require only $14 invested in Italian bonds to generate $1 of yield. The $36 difference is the perceived risk of default. Moving to companies, investors will pay $25 for income from a 10-year BCE bond, but only $20 for what should be a growing BCE dividend. The $5 discount for a historically growing dividend income stream compared to a fixed interest income stream is what we believe is a unique pricing anomaly.